My Hero’s Shadow (2018), the debut feature from writer-director Justin Young, is a fascinating, intimate and in-depth documentary. It explores the themes of family, forgiveness, judgment and perspective to masterful effect. Utilizing one-on-one discussions and a quietly poignant style that works wonderfully for the endeavor, Young crafts an arrangement that is as thoughtful as it is absorbing. There is also a distinct message of unyielding love, and that no one is purely noble or nefarious, at the heart of the piece. Such welcome notions make the exercise evermore timely and resonant. Young’s configuration is a meditation on the man who struck Nancy Kerrigan with a baton in 1994, Shane Stant. His private accounts, especially when addressing what led him to engage in such an action, are certainly eye-opening. Yet, the brilliance of the film emerges from the story being reflected through the compassionate viewpoint of Shane’s sister, Maile. She was only three years old when the incident took place. In so doing, her memory of her brother is shaped from who Shane became after the previously stated occurrence. 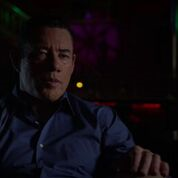 The foundation of the undertaking is erected when Maile meets with Shane 20 years after the attack. This is to openly converse on what transpired that day at Cobo Arena. Such is an undoubtedly gripping topic. It is one which Young handles in a manner that finds poetry in simple sights and communions. 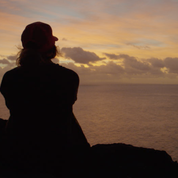 For instance, there is a memorable sequence where Maile speaks of an individual who found growth and tranquility in watching a sun rise for 142 days in a row. The glimpses into Shane and Maile’s childhoods that course throughout the project are just as harrowing. Such insights allow audiences to leave the 78-minute venture with a well-rounded sense of who these two people are personally. The bits that go into Shane’s public perception are just as well-done. With its economical length, efficient pace and technically skillful construction, Young’s exertion is a surefire triumph. Its alternately melancholy and inspiring tones deepen the picture of Maile and Shane that Young thoroughly paints. This is also true of those who have impacted the lives of the duo. In turn, Young formulates an incredibly illuminating composition; a tour de force that compels viewers to see the humanity in others. My Hero’s Shadow, which is currently seeking distribution, is a must-see! Hide in the Light (2018), the debut feature from co-writer and director Mikey McGregor, is moody, spectacular supernatural horror. The efficient and well-mounted 80-minute film effectively utilizes the time-honored device of the sinister being lurking unseen in the darkness. This is most noteworthy in the tense and exciting second half of the arrangement. Yet, the feature is so well-made, paced and tense that it never ceases to feel fresh and exciting. Richard Albert’s wonderfully creepy music, McGregor’s brilliant behind the lens work and Gonzalo Digenio’s rich cinematography only make the production evermore haunting and memorable. These qualities are enhanced by the stunning performances present throughout the endeavor. For example, Eric Roberts offers a phenomenal depiction as Father Wes. Additionally, Jesse James is terrific as Todd. The same can be said of Lindsay Lamb’s engaging depiction of Becca. McGregor’s movie tells the tale of a group of thrill-seeking friends. They break into the fictional Saint Petersberg Orphanage in hopes of exploration. 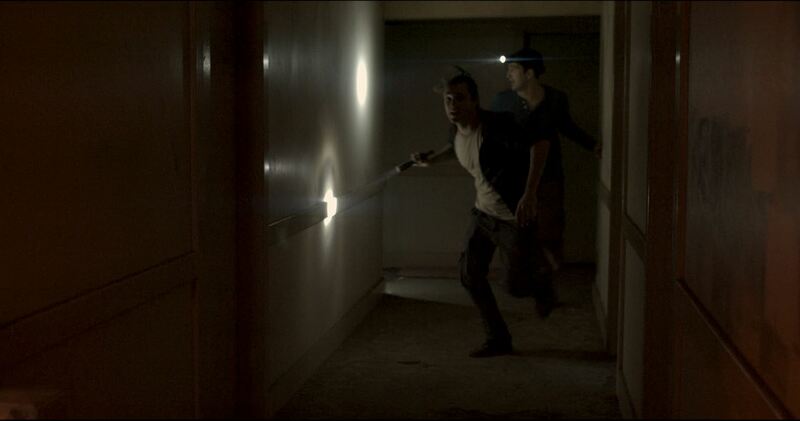 In so doing, they find themselves being stalked by paranormal forces. Eventually the credibly etched and relatable protagonists on-screen unveil that they can only find safety by doing as the title suggests. The symbolism of such an act, especially in a religious sense, is applied intriguingly to the project. This is without the notion ever being overdone. Such a solid narrative foundation calls to mind David F. Sandberg’s Lights Out (2016) in its concept. Yet, McGregor’s fabrication is comparable to James Wan’s modern haunted house masterpiece The Conjuring (2013) in its ability to unnerve. This is evident in the chilling five-minute prologue of the endeavor. It is set in 1966. In turn, McGregor and his fellow scripters Cynthia Bravo (who deftly plays Karen) and Digenio craft a tale that is as scary as it is entertaining. 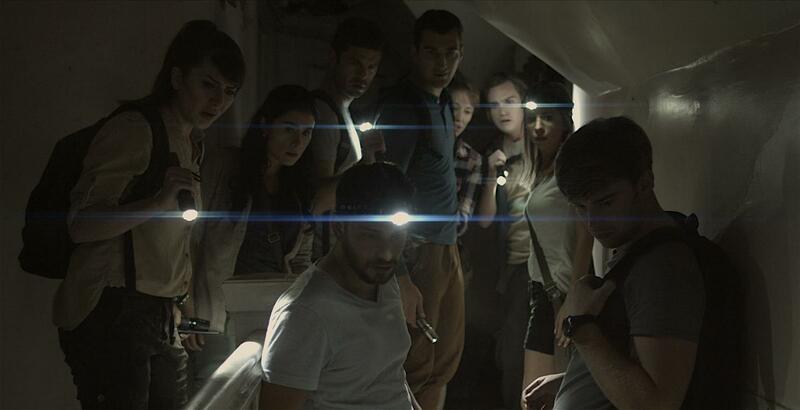 Hide in the Light is imaginative and harrowing; an instant genre classic! It will be released by High Octane Pictures later in the year. Hell’s Kitty (2016), the 98-minute sophomore feature from writer-director Nicholas Tana, is an affectionate and wildly hilarious sendup of the ardent bond between owner and pet. It also successfully operates as a loving parody of the horror genre. Particularly, the compositions of literary maestro Stephen King. Additionally, sly references to classic films rooted in this genre abound. Nods to Ghostbusters (1984), Poltergeist (1982), Killer Klowns from Outer Space (1988), Halloween (1978), the Friday the 13th franchise (1980-present), The Fog (1980) and The Omen (1976) are all cleverly woven into the fabric of the narrative. Yet, the most brilliant of these bits is a black and white lampooning of the iconic shower scene in Alfred Hitchcock’s masterpiece, Psycho (1960). It occurs near the one-hour mark. Heightening the enjoyment of this factor is an all-star cast of categorically related cinematic veterans. All of whom have small roles throughout the picture. They are also frequently named after personas from the opuses of terror mentioned above. Nina Kate’s amusing representation of Dr. Laurie Strodes is a wonderful example. Similarly, Doug Jones (2017’s stunning The Shape of Water) is terrific as Father Damien. Dale Midkiff (1989’s Pet Sematary) is engaging as Rosemary Carrie. Continually, Lynn Lowry is a delight to watch as The Medium. Courtney Gains is exceptional as Mordicia. A late sequence that kids the original adaptation of King’s Children of the Corn (1984), which Gains appeared in as the antagonistic Malachi, is another memorable highlight of the exercise. Based on both the web series and the comic book of the same name, the production is inspired by Tana’s own personal experiences with his cat, Angel. Such is a moniker shared by the feline cited in the title of Tana’s tale. In the affair, Nick (in a lively and charismatic depiction from Tana), is a Hollywood screenwriter. He is one whose attempts at romantic entanglements are constantly cut short. This is by Angel’s violent outbursts when women are around him. 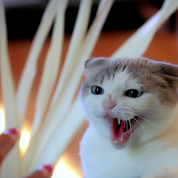 As these murderous eruptions increase in number, Nick believes his cat has been possessed by a demon. Seeking help from a variety of individuals, Nick attempts to stop the body count by getting his beloved companion exorcised. Such is a fun and inventive concept. It also works tremendously well. This is especially evident when combined with the proudly tongue-in-cheek execution of the exertion. Tana’s witty, heartfelt and skillfully paced script makes the most of this idea. The arrangement is complete with felicitous humor and dialogue. Correspondingly, the characters are just as smartly crafted and relatable. Furthermore, the sharp storytelling abilities in Tana’s screenplay are made increasingly alluring. This is via Tana’s charming and stylish guidance of the project. Assisting matters is the visually impressive opening and closing credits. Richard Albert’s music, with supplementary material from Wolfgang Lackner, is certainly tone-fitting. The most memorable and side-splitting of these selections is a number that sounds like a moggy-driven rendition of Jerry Goldsmith’s “Ave Satani” (1976). The playful effects, striking cinematography, excellent sound and proficient editing enhance the immersive pleasure derived from the undertaking. Produced by Denise Acosta, Hell’s Kitty is grand, 1980’s influenced entertainment. The intermittent sequences of gore are effectively constructed. Still, the labor is never overly reliant on these instances. This can also be said of the spirited scares Tana compiles throughout the endeavor. In so doing, Tana erects an impeccable atmosphere that mixes laughter with the paranormal. It is one that never wavers from commencement to conclusion. Highly reminiscent of Tim Burton’s timeless Beetlejuice (1988) and Peter Jackson’s The Frighteners (1996) in both quality and sheer rewatchability, Tana’s configuration is destined to be a cult classic! I recommend checking it out when it arrives on video on demand on March 13th, 2018.